Photo above: Gov.-elect Larry Hogan at podium shakes hands with Sam Maholtra, his appointee as secretary of Human Resources. From left, ex-Sen. David Brinkley, budget secretary; Maholtra; Hogan; Jennie Hunter-Cevera, acting secretary of the Maryland Higher Education Commission; Luis Burunda, deputy secretary of state; Clay Stamp, director of Maryland Emergency Management Administration. At his 13th and final news conference Thursday before his swearing in next week, Gov.-elect Larry Hogan made nearly two dozen appointments, including outgoing state Sen. David Brinkley, the former minority leader, as the new secretary of Budget and Management. Brinkley’s long anticipated appointment had stirred some opposition from the Republican far-right who objected to his votes for Gov. Martin O’Malley’s budgets during his service on the Senate Budget and Taxation Committee. Brinkley lost his reelection in the Republican primary to incoming Sen. Mike Hough, who had hammered Brinkley over his support of O’Malley’s budget. Brinkley had been the floor leader for Republican budget cuts that were routinely voted down by the Democratic majority. Brinkley was on Hogan’s transition team and had helped Hogan formulate his budget that he will release next Thursday. Former Sen. Bobby Neall will remain as an informal budget adviser to the Hogan administration. Brinkley has had a long career as a financial adviser in wealth management for private clients. Like all cabinet secretaries, his appointment requires confirmation by the Maryland Senate, where Hogan sees no problems getting its consent. Hogan’s appointment to his own staff do not require Senate confirmation. Human Resources deals with welfare and family issues such as foster care and child abuse. Jennie Hunter-Cevera was named as the acting secretary of the Maryland Higher Education Commission. Hunter-Cevera is the founder and CEO of Hunter-Cevera and Associates, a consulting firm that helps biotechnology companies and government agencies, Hogan said. Her higher education experience includes serving as president of the University of Maryland Biotechnology Institute and executive vice president of the Research Triangle Institute in North Carolina. Clay Stamp was named director of the Maryland Emergency Management Agency. He has decades of experience in emergency management, and has served as emergency services director for Talbot County for the last five years. Former Sen. Marty Madden, another former Republican minority leader who had represented Howard and Prince George’s counties, as senior adviser to the governor. Madden served on the Hogan transition team. Brad Peganoff will be the head of the governor’s D.C. office. Outgoing Del. Steve Deboy, an ex-cop who had represented Baltimore and Howard Counties, will be a legislative officer lobbying the General Assembly. DeBoy had served on the Appropriations Committee and was House chair of the Joint Audit Committee. Hannah Marr, a campaign deputy press secretary, and Lorena Rivera as deputy press secretaries. Hogan has not yet announced who will head the state police, or named the secretaries of disabilities or information technology. Hogan said the state police appointment was in the works. A list of senior appointments follows, with contributions from Capital News Service. Pete Rahn, called by Hogan “the best highway builder in the entire country,” was appointed the secretary of transportation. He previously worked in New Mexico and Missouri. Rona Kramer, a former Democratic senator from Montgomery County, was appointed secretary of aging. She is senior vice president and general counsel at Kramer Enterprises, a commercial real estate company. Her father, Sid Kramer, was the Montgomery County executive and a state senator, and her brother Ben Kramer is a current member of the House of Delegates. Ken Holt, a Republican former delegate from Baltimore and Harford counties from 1995 to 1999, was appointed secretary of housing and community development. David Craig will be the new planning secretary. Craig was a Republican gubernatorial candidate last year, but lost to Hogan in the primary. He was a county executive in Harford County from 2005 to 2014, a former senator and delegate with a long career as a public school administrator and teacher. Outgoing Del. Keiffer Mitchell, D-Baltimore, will be a senior adviser overseeing charter schools for Hogan’s administration. He also served on the Baltimore City Council from 1995 to 2007 and was a mayoral candidate in Baltimore. Sen. Chris Shank, R-Washington, will resign as the current minority whip to run the Governor’s Office of Crime Control and Prevention. Outgoing Del. Jeannie Haddaway-Riccio, R-Caroline, Dorchester, Talbot and Wicomico, has been appointed the director of Intergovernmental Services. She ran as Craig’s running mate for lieutenant governor in the primary. Thomas “Tim” Hutchins will be the new director of Homeland Security. He was superintendent of state police under Gov. Bob Ehrlich. Prior to that, he was secretary of Veterans Affairs and served in the House of Delegates as a Republican from Charles County. Steve McAdams will head the Governor’s Office of Community Initiatives. He previously worked with Hogan at Hogan Cos., and was the founder, owner and president of Residential Appraisal Service, according to Hogan Cos. He was also a commissioner for the Maryland Real Estate Appraisers and Home Inspectors Commission. Arlene Lee will lead the Governor’s Office for Children, a position she held from 2005 to 2007 under Ehrlich. Robert Scholz has been appointed counsel to the governor. He is a partner at Niles, Barton & Wilmer LLP, a Baltimore-based law firm, and has a background in corporate and commercial law. He is a past chair of the Maryland State Ethics Commission. Mike Gill has been named the secretary of Business and Economic Development. He is the chairman and principal of Evergreen Advisors, a mid-Atlantic investment bank, and has served on the Board of Regents for the University System of Maryland and the Baltimore County Economic Development Commission. Van Mitchell, the new health secretary, is a Democratic former delegate from Charles County, where he served from 1995 to 2004. He has worked for Manis, Canning and Associates as a lobbyist. Mitchell served as a principal deputy secretary of Health and Mental Hygiene from 2004 to 2007. Ben Grumbles will be the new secretary of environment. He was an assistant administrator for water at the Environmental Protection Agency, and was the director of the Arizona Department of Environmental Quality. Charlie Evans will be the secretary of the Department of Natural Resources. He was previously in the private sector and is known as the “grandfather” of the Chesapeake Bay Restoration Fund while he was an assistant secretary in the department. Joe Bartenfelder, a lifelong farmer, is the new secretary of Agriculture. He is a Democrat and former delegate from Baltimore County from 1983 to 1994. He was also a member of the Baltimore County Council from 1994 to 2010. Jimmy Rhee, a former assistant secretary of commerce and trade in Virginia, will be the special secretary of Minority Affairs. He has worked in the private sector for technology companies. Brig. Gen. Linda Singh will be the adjutant general leading Maryland’s National Guard. She served in the U.S. Army for 33 years, and was a managing director at Accenture, the national consulting firm. Jim Fielder has been appointed the new appointments secretary, a job Hogan held under Ehrlich. At that time, Fielder was the secretary of Labor, Licensing and Regulation. Gail Bassette will be the secretary of General Services. She is the president and CEO of TCE Inc., a consulting firm that works with the Maryland Department of Transportation, according to her company. Sam Abed is the secretary of the Department of Juvenile Services under Gov. Martin O’Malley, and will continue in his position for the Hogan administration. Del. Kelly Schulz, R-Frederick, will take over as secretary of Labor, Licensing and Regulation. She is a partner in a consulting firm. Craig Williams will be Hogan’s chief of staff. He was deputy chief of staff for Ehrlich from 2004 to 2007. 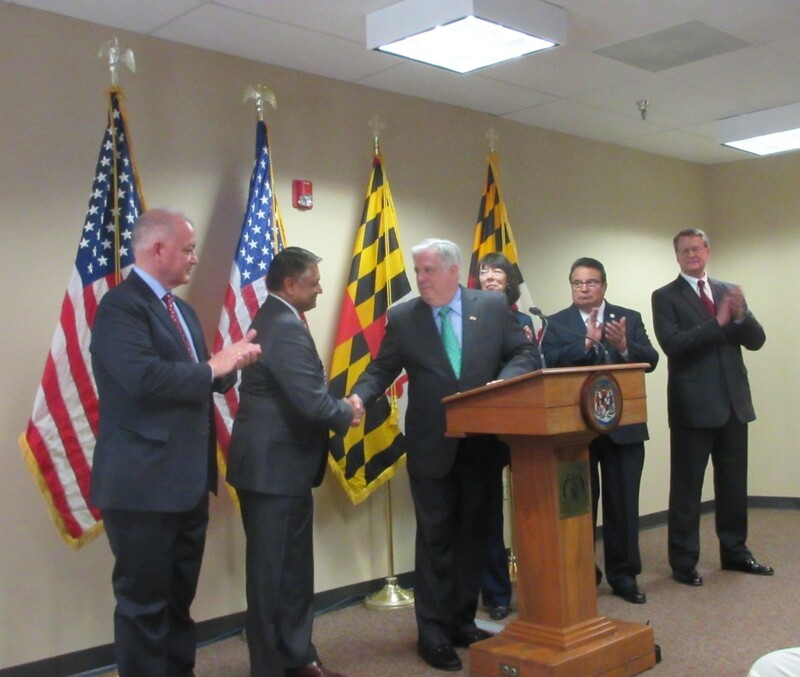 Sen. Joe Getty, a Carroll County Republican, has been named Hogan’s chief legislative officer. Getty also served in the House of Delegates from 1995 to 2003, representing Carroll County, and was policy director for Ehrlich. Stephen Moyer will be the secretary of Department of Public Safety and Correctional Services. He was in the Maryland State Police as the lieutenant colonel and deputy superintendent, and was deputy secretary of the Department of Juvenile Services. He serves as deputy chief of Sarasota Police Department in Florida. Al Redmer, a Republican and former delegate from Baltimore County, will be the new insurance commissioner, a post he held under Erhlich. While in the House of Delegates from 1991 to 2003, he served as minority whip, and he also worked for the Chesapeake Bay Advisory Committee in Baltimore County. George W. Owings III will reprise his role as secretary of Veterans Affairs, which he held from 2004 to 2007 under Ehrlich. A Democrat, he was also member of the House of Delegates from Calvert County, from 1988 to 2004, and served as majority whip. John C. Wobensmith has been named Hogan’s secretary of state. He worked for five U.S. presidents and was the senior Defense Department representative in Turkey.